Finnamyl is offering certified organic potato starch to the market – including NOP certified potato starch from Aloja Starkelsen in Latvia. We actually have some stock left but we also want to discuss the future needs of our customers and start discussions for contracting the 2012 campaign. Nordic Koivu is offering birch sap into three different channels: for retail in the beautiful 500 ml glass bottle, for the beverage industry for developing exiting new products and for the natural and organic cosmetics industry. Finland and Sweden are together in one joint block in Hall 1 – Stand 602 between the Danish and the French. Altogether there is some 10 companies in Finnish-Swedish block which is less than for many years. It might look like a backward development but actually the biggest single reason is probably the very positive development in those countries. The manufacturers have markets closer by! In Finland the organic market value grew over 50% in 2011 and we expect strong growth to continue through 2012. See you all at BioFach! The story about Linkosuo Rye Crisps is a story about Rye, how traditional Finnish bread adapted to modern times and the history of the family owned Linkosuo bakery company. Traditional Rye Sour Bread drying on a pole at Peltolan Organic Farm in Vilppula, Finland. Rye of course is the healthiest grain used for baking bread. The history of rye in Finland goes back over 2000 years and it was the predominant grain in Finland through the middle ages (replacing barley) until the early 20th century. Still a major part of bread in Finland is rye bread. The archetypes of rye bread is the “reikäleipä” or the round hole sour bread and the round sour rye bread “ruisleipä” with a simple recipe: rye, water, salt. So this is a sour bread with 100% wholemeal rye flour – no wheat and no yeast. The hole bread has the hole because in the old times the bread was hung on poles to dry close to the ceiling of the house. Western Finnish tradition stressed rare baking sessions combined with long-term storage. Of course the dry bread would be too hard to bite but it would be soaked in soups or milk. Nowadays with commercial bakeries baking fresh bread every day this tradition has largely disappeared. Linkosuo Rye Crisps in different sizes. Linkosuo Rye Chip with traditional organic Finnish "Bread-Cheese" and organic rucola..
Linkosuo Rye Buttons with cheese, sour cucumber and paprika. All organic. Linkosuo was the first to adapt the dry rye bread to commercial baking. The first version was just a thinner version of the traditional hole bread. It is not produced anymore because the bite was far too hard – even for Finnish teeth. The breakthrough innovation was to tear the upper part and bottom of the bread apart before drying resulting in a thinner and crispier dry bread known as “Varrasleipä”. Varrasleipä has been hugely popular in Finland for decades. Finland, as the rest of the Western world, has developed a taste of snacking and this challenge was met by developing the hole of the traditional bread into a “Rye Button”. The Button could easily be used at home or f.ex. at parties as a kind of delicious cocktail snack by just putting butter, cheese, cutleries, vegetables etc on the Rye button. The most recent modernization of the Rye Crisp was to develop it into a real snack – ready to eat as it is. This was achieved by adding some wheat to the dough to make the Rye Chips bite easier and crumblier and to flavor them. The non-organic range of flavored Rye Chips is already on the market in Finland but also the flavored organic Rye Chips range are in the pipeline. We have already tasted them and they are delicious! But the pure rye version “Aito Ruis” might still be the best. So keep posted and I will let you know as soon as they are available. You can also already get Finnish Ruis – the fresh bread – in New York. Visit www.nordicbreads.com to see how two Finnish brothers bake real organic Finnish Rye Bread or Ruis Bread in Queens. We are enjoying the last weeks of this summer and soon entering September. Again we have a few new companies joining Organic Food Finland. Let me present them shortly here – we will post more information later and of course update the www.organic-finland.com web-site. Nordic Koivu in Eastern Finland produces a really unique product that is both refreshing and healthy: Birch Sap – which in many parts of the world is considered herbal medicine. The product is well known everywhere where the birch grows naturally, i.e. most of the temperate parts of the northern hemisphere. Usually birch sap is consumed fresh in the spring when it can be harvested from the birches. Birch sap is highly perishable and even in a refrigerator you can keep it only for a few days. Usually bottlers use preservatives or heat treatment but Nordic Koivu has developed a method for bottling the birch sap without any preservatives (nothing added) or heat treatment. So the product retains its full quality. ViiniVerla is an other “one of it’s kind”: the only organic winery in Finland. There are about 25 wineries in Finland, i.e. farms that produce alcoholic drinks of berries and apple. Grapes don’t grow in Finland – apart from some enthusiasts back yards in Southern Finland. In the Finnish wine competitions ViiniVerla has faired very well and personally I am a fan of the sparkling wines and the liqueurs, especially cranberry and cloudberry. This is certainly something you should taste! Keskinen Mills‘ in Central Finland is a small mill specialised in gluten-free buckwheat. The buckwheat is grown in the region around the mill. The main products are flour for the gluten-free bakeries and organic buckwheat pasta. So this is something for both the organic and gluten-free market – which in some countries are somewhat merged. Keskinen Mills’ guarnatees that no grain gets mixed with the buckwheat and therefor celiac patients can safely consume their products. BioFach will open tomorrow. In the picture Finlands 150 m2 stand being constucted. Beside Finland is Sweden also with 150 m2 so together the “Organic North” has a very nice 300 m2 stand area. So starting tomorrow we’ll see how well people find us in Hall 3. Let’s hope for the best! Well everyone in the organic movement / industry knows BioFach. But I believe there must be a lot pf people who visit BioFach who don’t really know the history. I made a presentation to the group of Finnish companies exhibiting at BioFach this year some weeks back. I wanted to give them some background information: when and where was BF started. It was surprisingly difficult to find that information anywhere. You don’t find it at www.biofach.de. It took quite a lot of effort on google to find anything but finally I did find an article from the German EVE magazine – actually the number published for this BioFach. It hadn’t reached me in print yet. BioFach becomes 20 years this year! It started in 1990 in Mannheim. It moved to Wiesbaden, to Frankfurt and in 1999 to Nürnberg. In 2001 Nürnberg Messe acquired BioFach. I visited BioFach for the first time in 1995 in Frankfurt. We were the first from Finland to exhibit in 1996.I organized the Finnish pavillion in 1997 when the Nordic countries where the Region of the Year. Since 1996 I have exhibited almost every year. 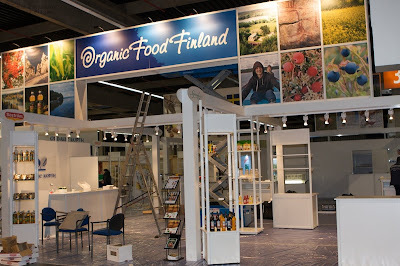 Since 2004 I have exhibited with Organic Food Finland, the export group for organic products from Finland. This year there will be 7 companies from OFF and 4 others companies exhibiting from Finland – the biggest number since 1997. This is also the first year since 1997 that we are back to some kind of Nordic cooperation – if only between Finland and Sweden. Denmark – where the organic export business is by far bigger – is Country of Year with a huge 1000 m2 stand area in Hall 1. 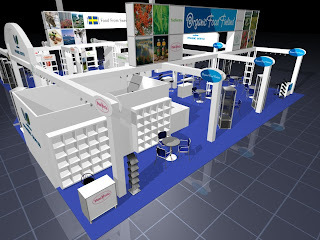 Finland and Sweden – under the “Organic North” banner will have 300 m2 together in Hall 3. Good start and I hope we will benefit from each other. As you can see “Organic North” has been designed as one block in two parts. We hope to benefit from each others pre-marketing and communication and we are arranging the Friday Night Party together. Welcome! The Swedes have made a lot of noise about Janne Schaffer – the former ABBA guitarist – who will play live on Friday Night. ABBA is obviously important! Snack will be provided from both sides and as the Finnish speciality of 2009 we are providing the drinks: organic sparkling wines from ViiniVerla, the only organic berry winery in Finland. Come and have a taste! I think ViiniVerla will need to find only 1-2 customers in Europe and the business is pretty much done. And you’ll be surprised by the taste and quality. They do have liqueurs and spirits as well! The other first time ever is the fact that the Finnish Minister of Agriculture and Forestry Mrs Anttila will visit BioFach. Until now we have done BioFach pretty much alone – or let’s say business driven – without the kind of political support f.ex the Danish and Swedish organic industry is getting. No speeches and press conferences etc with lots of people in black suits. I’m not sure how much it helps the business anyway but I certainly do believe that it will have a profound impact on the understanding of the organic industry on the side of the Finnish Minister. Only once a higher-ranking official from the Finnish Ministry of Agriculture has visited BioFach – and that was in 1997! I think they don’t have a clue of how big the business is. And why have they never come? I am afraid the main reason might be pretty “funny”. Week 8 is the winter holiday week in South Finland. You go with your family to Lapland, to the Alps or whatever but you don’t go to an exhibition in the middle of Germany. Guess who hasn’t had a proper winter holiday with his kids since 1995? Well – see you all at BioFach next week and let’s hope the economic downturn isn’t affecting the number of visitors too badly. See you! Finland and Sweden have joined forces under the theme Organic North at the BioFach World Organic Trade Fair. BioFach will be held on 19-22 February 2009 in Nuremberg, Germany. Organic North presents contemporary Nordic organic production and services. The Finnish Minister of Agriculture and Forestry Mrs. Sirkka-Liisa Anttila will attend the exhibition on 19-20 February 2009 and will open the Finnish joint stand on 19 February at 11.45 a.m.
“I am delighted to have the opportunity to promote Finnish organic production at the BioFach Fair. Finnish organic products are reliable, ethically produced and fully traceable items which are safe to consume. Essential for the future of organic products is the efficiency of the food chain as well as the common goals of sector actors,” says Minister Anttila. ”We need professional and innovative people to produce and develop new products and services in order to constantly improve the renowned quality of the Nordic organic sector. I’m convinced that organic production will be one of the future success stories of the Finnish food industry,” says Anttila. An Organic Action Plan is under preparation in Finland and the work has been funded by the Ministry of Agriculture and Forestry. The action plan reflects the rapidly growing importance of organic production and the high public demand for organic products. Of Finnish farming land, 6.5% is certified organic and 7 million hectares of forest land are certified for the harvesting of organic wild products (mainly berries). The most important sectors are cereals, including rapeseed, together with dairy, meat and bakery products. Wild berries are also increasingly important. Most exports are from the cereal value chain, most notably oats. Finland is renowned for producing the best quality oats in the world. Additionally, potato products and berry-based products are also exported. ”Our main task has been to increase general knowledge of Nordic organic production and products in Europe. BioFach has grown into an event of huge proportions, and small exhibitors have to use every available means to get the most out of the event. That’s why Nordic cooperation and the benefits it will generate are a natural way to increase the visibility of a single participating company,” says Erkki Pöytäniemi of Organic Food Finland. Organic Food Finland, implemented in cooperation with Finpro, is an export group specialising in organic products. Organic North Project Director Arto Varanki from Spokesman Oy is also a strong supporter of Nordic cooperation: “Cooperation with Sweden is a very important step and we are planning and implementing communication measures to attract the maximum amount of visitors to our pavilions. Hopefully this will also encourage the other Nordic countries to join,” says Varanki. BioFach is the world’s largest organic fair. It is held annually, each February, in the Nuremberg Exhibition Centre in Germany. BioFach has sister events in Japan, China, India, Brazil and the United States. In 2009 BioFach will also feature natural cosmetics, skin care and wellness products, which will be assembled in their own event under the name Vivaness. Besides its traditional offerings, the exhibition will also offer over 100 organic sector events and seminars. The Friday Night Party will be held on 20 February from 6–8 p.m. at the stand, featuring former ABBA guitarist Janne Schaffer and an assortment of Finnish and Swedish organic delicacies. The Organic North pavilions are situated in Hall 3. The stand numbers are 300 and 400. You are most welcome join us at the party.